The life and times of chocolate obsessed children. As some of you may know my daughter gets sick...a lot! All of my kids seem to be pretty tolerant of pain, so we knew when he heard her screaming Friday night something was up. Imagine yourself sound asleep in your nice warm bed, when you are suddenly woken up by a child screaming at the top of her lungs. The kind of scream you would expect if she were being attacked and hurt by her older brother. She came in our room around 2 am, screaming that her ear hurt. We calmed her down, gave her some ibuprofen and got her to go back to sleep. When we woke up the next morning we call the pediatrician and got her an appointment for later in the morning (lucky for us our pediatrician has an office about 30 min away that is open on Saturday). After the Dr. examined her she determined it was indeed an ear infection. As long as it wasn't another UTI then I was happy! She gave us a prescription and sent us on our way. Giving our daughter the OK to do whatever she wanted as long as she felt up to it. We had previously planned to go hang out with some friends camping at Del Valle, we decided to still do that. We got up to the campsite and not even 10 min later her eardrum ruptured. There was nasty ear ooze everywhere! Lucky for us one of our friends who is a Pediatrician was there and he said it's common for that to happen, and that she would actually feel better since it did rupture. He was right, as long as she had ibuprofen and a a tissue she was fine. Her ear oozed for the better part of 3 days, by Tuesday it had stopped. Now we just need to make sure she keeps her ear clean while the eardrum heals. Lucky for us this all happened during spring break. What an adventure for her to tell her friends when she goes back at the end of spring break! Well it feels like it! I am so blessed to have a little girl who gets sick...a lot! I also have a little boy who has 2 left feet (literally)! So I better post my experiences as to "warn" parents of the perils of being an oblivious parent. It all started on a crisp fall morning, my 9 year old was sitting in a bar stool balancing it on 2 legs. Now we have told this child multiple times not to do that, and this morning was no exception. Seeing that he is 9 and apparently knows more than me he did it anyway. Well he fell and hurt his foot. We figured it was just bruised and he would be up running around again soon. He screamed he wailed and thrashed around a bit in pain, but sure enough it went away and he was back to "normal". So we thought. I noticed the next day that he was limping, he said it still kind of hurt. Two more days passed and he was still limping, he swore to me that he was fine. He limped around all at basketball practice. Fast forward to Saturday, the day of his last basketball game, he was still limping but said he was fine. We let him finish his game and when he got home I insisted on taking a closer look at his foot. It was swollen to twice its size! There was even bruising on top of his foot. He would cringe every time I would touch it. By the time we noticed the injury it was too late to go to urgent care, I didn't want to pay the deductible for the ER visit (seeing as it probably wasn't life threatening). So we waited until Sunday to take him in. On Sunday I decided that he maybe able to wait until Monday to see his regular dr. We happen to have a friend who is a Pediatrician he took a quick look and said he could wait but to take him in on monday. By now the bruising had spread to the bottom of his foot and it was still swollen. I got him into the Dr first thing Monday morning, she quickly got us a referral to a podiatrist. I went directly from the pediatrician to the podiatrist, with 3 kids in tow...not a fun experience for me! The Podiatrist took a look and assesed that he needed xrays and proceeded to order a boot for his foot. By this time I started to feel pretty bad that he really was not faking the injury. I pawned two of my kids off to a super great friend (who let me do it at the last minute) and took the oldest to the hospital for xrays. I was SHOCKED at what I saw. His foot was not just sprained it was completely BROKEN!!! I felt horrible for making him walk, run and play basketball on it for a WHOLE week before figuring out the problem! Funny enough, he didn't act like it hurt him. Even the podiatrist was amazed at his tolerance for pain (this is quite unusual for a kid who cries over papercuts). He was sentenced to 4 weeks in a boot, thus prohibiting him from his usual jumping, riding and running activities. I'd like to say the boot slowed him down, but it didn't. It was quite the site to see him riding down the street on his scooter in his boot. I guess injuries really can't slow a determined child down! 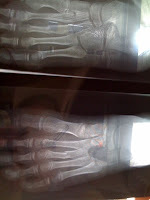 Can you see in the picture where the broken bone is? Look closely! How do you explain the death of another child to your children? Over the past week there has been a series of events unfolding in my town. A little girl vanished...into thin air! Literally, she was on surveillance camera one minute and gone the next. Without any clues as to where she may have gone. For over a week the town I live in has come together to look for her. People who do not even know this child have put countless hours into the search for her. She was a student in another school in our district, her disappearance has been the topic of the playground discussion. "Where is she?" my 9 year old asked me. "I don't know, but I hope they find her soon". This brings us to today's events. A suitcase was discovered on the outskirts of town, in an irrigation pond. A 9 PM press conference revealed the worst case scenario. Her poor lifeless body was thoughtlessly stuffed inside. How do I explain this to my children, they have heard about what happened, they will ask in depth about how she died and who did this to her. I can only pray for the guidance to give them the answers they need. Here I sit holding my sweet little 3 year old asleep on my lap, feeling heartache for the mother who will never hold her child again. I hope they figure out what happened so her parents can find peace with her death. This past week was the Blue and Gold dinner for cub scouts. The theme was what I want to be when I grow up, complete with a cake decorating contest. It was so cute to see all the different themes; including: baseball player, football player, astronomer, zoo keeper and lego builder. All of the career decorated cakes looked good enough to eat (and that we did!). There we fireman, policemen, Doctors, lawyers and even a gum sales analyst there to talk to the kids. A big thank you to everyone who made the evening fun for my family! Kids are funny about money, they think it's a magical thing that appears from nowhere. My daughter had a couple of dollars sent to her in a birthday card. Well being the carefree person she is, she left them out where her little brother could find it. My youngest had just observed his Dad shredding old papers over the weekend. So he of course decided he would do the same with the "paper" he found on the floor. My daughter caught him in the act, and her once whole dollar bill is now only worth about 50 cents! It's been a busy week at our house, two out of 3 kids celebrated a birthday this week. We've had 2 birthday child birthday dinners, 1 family birthday dinner and coming up this weekend we will have 1 video game party and 1 day out with the girls. Are you tired yet? I am! Happy Birthday to my Boy Wonder! Happy Birthday to my Princess Paya! We love you even more now than the day we brought you home! I've been having a bit of a hard time lately, I'm not sure why but I've been in this funk that has been really hard to get out of. I decided to take matters into my own hands and go somewhere to get away. I found a great deal on a trip to London and talked my sister into going with me. I can't tell you how nice it was to get away, to step back from being a mom and business owner. I tend to over analyze things and stress myself out easily, I can be so hard on myself that I just needed to relax and not sweat the small stuff. Anyways, London was amazing! I went for the first time when I was pregnant with my daughter, I fell in love with the city then. Going back only reinforced how much I want to live there, it is such an amazing and beautiful city. I love wandering the streets, I love it that people don't work super long hours, that is a city of that size shops still close at 6 and have late night shopping once a week. I love it that when you get on the tube the men stand up and let the women sit. The city is clean even though rubbish bins are hard to find, rarely will you see a homeless person on the streets. I love it that the museums are free and always packed!! I love it that their version of a parade has nothing to do with clowns and candy being thrown out. It is really one of my favorite places! Bloggers I love to read! I'm a work obsessed pyschotic mom of 4 chocoholics!